At this time of year this low growing shrub is covered in little berries graduating from pink to coral, very eye catching, but the pretty fruits which follow the yellow spring flowers disguise the true character of the plant, which is spiny! 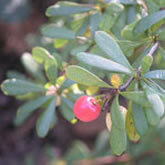 It has a lovely arching, spreading habit too with small, waxy leaves that turn from green to red to orange in autumn. Introduced by Birmingham Botanical Gardens ex student Ernest Wilson in 1904 from China and named in honour of his wife.